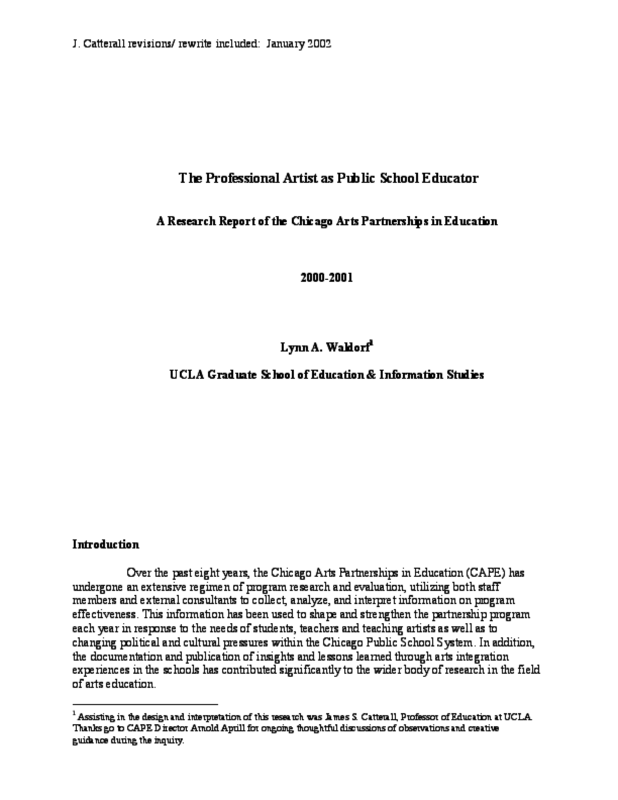 Over the past eight years, the Chicago Arts Partnerships in Education (CAPE) has undergone an extensive regimen of program research and evaluation, utilizing both staff members and external consultants to collect, analyze, and interpret information on program effectiveness. This information has been used to shape and strengthen the partnership program each year in response to the needs of students, teachers and teaching artists as well as to changing political and cultural pressures within the Chicago Public School System. In addition,the documentation and publication of insights and lessons learned through arts integration experiences in the schools has contributed significantly to the wider body of research in the field of arts education. During the early years of the program, evaluation efforts focused on general descriptions of the program goals and objectives along with initial impacts on student life. Positive trends were identified in terms of administrative and faculty attitudes and increased involvement in thearts partnerships, due mainly to student interest. More recently, a closer, more detailed analysis of CAPE's growing influence on student learning, teaching practice and school climate has highlighted the value of quality, arts integrated instruction, including evidence of positive effects on standardized math and reading test scores. Last year, our research turned to program sustainability, partly in light of reduced funding, as well as to the assimilation of new partnership schools and an increasing organizational focus on the professional development of participating teachers and artists. In the vast majority of cases, CAPE partnerships have evolved through trials and successes to bring lasting effects on administrators, teachers, and students. Copyright 2004 Chicago Arts Partnerships in Education (CAPE).